WASHINGTON (AP) — The total number of migrant children in federal custody after being separated from their parents has barely changed since last week, Health and Human Services Secretary Alex Azar told Congress on Tuesday. At a Senate Finance Committee hearing, Azar said HHS currently has 2,047 migrant children in its custody because of the Trump administration’s “zero tolerance” policy at the southwest border. That’s only six fewer children in total than the 2,053 HHS had previously reported as of Wednesday of last week. Azar didn’t say whether in the meantime additional children had been transferred to HHS. That’s nowhere near enough progress, said Democratic senators questioning the health chief. 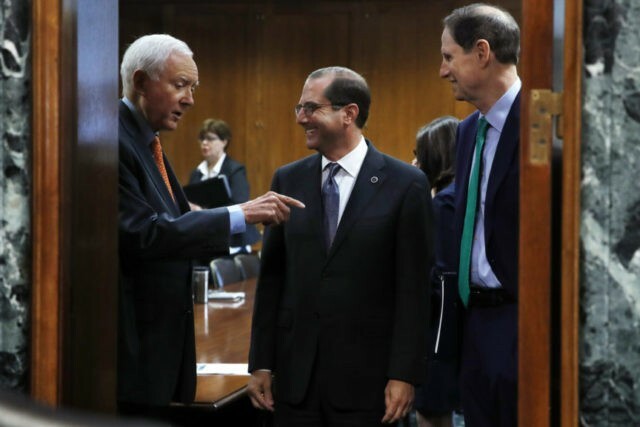 “HHS, Homeland Security, and the Justice Department seem to be doing a lot more to add to the bedlam and deflect blame than they’re doing to tell parents where their kids are,” said Oregon Democrat Ron Wyden. Azar said he’s hampered by a court order that says children can’t be held longer than 20 days with parents detained by immigration authorities. However, lawyers for the migrants say the administration can get around that barrier by temporarily releasing the parents while their asylum cases are being decided by immigration authorities. Many parents have trekked north from Central America fleeing rampant violence in their countries, to seek asylum under U.S. laws. A fact sheet released by HHS late Saturday said Customs and Border Protection had reunited 522 children in its custody with their parents. It was not clear if that refers to another group of children, those who had not yet been turned over to HHS shelters. At one point, Azar suggested the number of children in HHS custody had been as high as 2,300. Wyden pressed Azar repeatedly on how many parents actually know where their children are. Azar responded that “every parent has access to know where their child is” and could communicate with them by phone or through Skype, if it’s available. ICE officials have posted notices in all its facilities advising detained parents who are trying to find their children to call a toll-free hotline. But there have been reports from the field that parents have had trouble getting the information they need. Azar refused to be pinned down on how long it would take to reunite families that were separated at the border. “We have to expeditiously get children out of our care,” he said. He echoed President Donald Trump’s calls on Congress to change the law so that immigration authorities are no longer barred from holding children together with their parents for more than 20 days. Asked about the age of children in HHS custody, Azar said, “We have infants in our care.” But he said that’s not just as a result of Trump’s now-suspended “zero tolerance” policy. “As shocking as it sounds, we have always had infants at our care,” he said, adding that babies are sometimes found abandoned at the border.